Before there were the 3D blue people getting about in skimpy outfits and touching each other inappropriately with their ponytails, this smart, funny and well crafted Nickelodeon series was entertaining both child and adult alike. Following 112 year old Aang, an Avatar (Earth’s spirit incarnate) who is charged with bringing peace to the Earth, Water, Air and Fire nations by defeating the evil Fire Lord. Along with his eight-legged bison Aapa (think Miyazaki’s Totoro crossed with Pikachu), siblings Kotara and Sokka, and Toph, he travels through each nation gaining skills before his final show down with the war mongering Fire Lord Sozin. 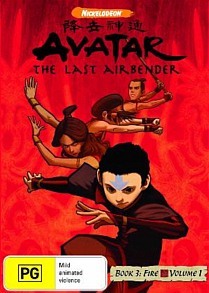 Each series or book Aang masters a new style of bending – a fighting style utilising a specific element, and at the start of this final book, he is just mastering the principals of firebending. From that description alone, it may sound like the stuff of standard Saturday morning television. But what sets Avatar apart is the amount of detail creators Michael Dante DiMartino and Bryan Konietzko have gone to create a truly immersive universe. A particular example of this is the effort gone into differentiating each nation and it’s people from the other, from the landscapes they inhabit, their demeanours and beliefs, to the way they move. Visual references range from traditional Asian cultures to John Woo, The Marx Brothers and The Matrix permeating both the dynamic fight sequences and the narrative. The current trend of chopping an entire series up into sets of saleable packages poses a problem here, as sometimes one can end up with a dud batch – it’s just how it is, keeping a consistent level of quality through tens of episodes is a problem unique to television. As this disc is just the first five episodes of the final series, the majority of episodes are exposition focused, briefly introducing the key players in the inevitable showdown at the end of the series, which in one sitting can feel a little slow. That being said, the fourth and fifth episodes (“Sokka’s Master” and “The Beach”) are hilarious, focussing on the likeable B characters inhabiting the Avatar universe. The special features are limited – audio commentaries are provided on episodes four and five with the creators, martial arts consultants and writers which would be interesting to fans interested in the specifics of production. As any long time fan of the show would know, any Avatar episode is worth it, so if you can’t wait for the box set, run out and grab this.